Throughout my school life I always wanted to get a job that involved drawing or art in some way, seemed to be the only thing I was really any good at or knew anything about. Art was the thing that kept my mates happy or bullies off my back throughout my school life. I would spend hours at home doing pencil drawings of Knight Rider, the A-Team, Airwolf or DangerMouse, bring the drawings into school the next day and distribute them out. When I left school my first ‘job’ wasn’t a job as such, It was working on a YTS (Youth Training Scheme). It was held in a classroom environment and involved producing different kinds of artwork with different materials. I was doing the thing I’d always wanted to do and being paid for it, but at £40 per week it was never going to get me anywhere. What was your first computer is that your favourite computer or do you have a different favourite? The Speccy was my first computer. My mate up the road had one and having played for hours on his, I had to have one too. It was like a box of dreams! Every game seemed to stretch your imagination and it felt like every game had endless possibilities. I remember playing Skool Days and thinking that there was nothing you couldn’t do in it, it was like an interactive experience. I used to go home thinking of things I could try and do within the game when I was next around at my mates. I completely loved the Speccy, it was my favourite home computer, followed very closely by the Amiga. Well, after discovering that there was more to the Speccy than just playing games, I started messing around with graphics. It was like stepping through a portal into another world! I could actually draw anything I wanted using all the graphical might of the Speccy(!). I began churning out graphics and screens and after a while this soon became a hobby. Eventually, after a long while, I began to show these screens to my friends who were genuinely surprised that I had kept my computer artwork secret for so long. I never really thought much of it, it was just something I enjoyed doing, didn’t seem like I had broadcast it. Many months passed then one day a friend of mine saw an advertisement for Codemasters in the back of one of those bi-weekly computer mags. It was a recruitment drive for artists to join the software company. One of my mates had saw this ad and suggested I go for it, I shrugged this off as a bad joke, my work was OK but nowhere near the level of some of the big names around at that time. This friend persisted with his suggestion for the next few weeks, eventually, after I had my head completely pecked, I said ‘OK’ but only if he were to write a covering letter for me, I might give it some thought. Well, this ‘friend’ actually did produce a well written/crafted letter that surprised me as I thought he was trying to take the p*ss all this time! Anyway, I gathered some of my screens and graphics samples together and slapped them onto a C90. The cassette and letter where then fired across to Codemasters, I thought nothing more about. About a week-or-so later, I came home from my YTS and was greeted by a large cardboard box that had been delivered to me. Inside, there was a big collection of Codemasters Speccy games along with a letter. The letter said that my artwork had been assessed and that they were very impressed with what they saw and would I be able to visit their offices for a chat. I was completely gob-smacked and I couldn’t believe it. 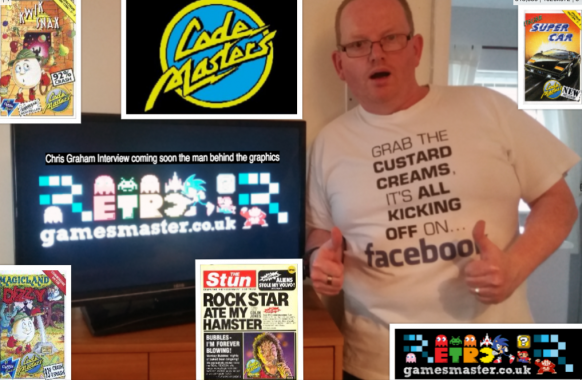 What was your first day at Codemasters like and who made you feel welcome? Tim Miller (programmer on ATV Simulator) was very kind and took me around all the offices at Codemasters. Back then it was converted farmhouse and a small bunch of porta’ cabins. I sat with different programmers and artists throughout the first day and everybody was kind enough to explain what they did, what a normal working day was like and what people tended to do after work. I took very little in, I was completely starstruck. When I first started work at Codemasters I had nowhere to stay so I was living from a hotel. Some weekends, when I was working at the offices, instead of getting a taxi back to Leamington Spa to my hotel, I’d sleep in a porta cabin overnight in a sleeping bag. I’d stay up most of the night playing games on all the different computers and consoles that surrounded me, it was heaven! Your first project at Codemasters? 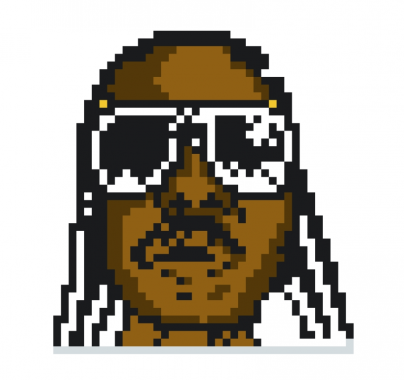 What is the funniest thing and most frustrating thing that happened to you at Codemasters? I remember one time when the Darling brothers were racing an old, rusty moped around the fields at the back of their old farmhouse. They asked me and some other developers to join in taking it in turn to race this thing around a field. On my turn I hit a bump and was flung through the air before landing on the grass in a crunched up heap. I remember lying on the grass and laughing my head off about it, the whole situation, where I was with my life and how things had progressed. I lay back on the grass, looked up at the sky and waited for the inevitable alarm clock to wake me up for another day at YTS, it didn’t. I felt like the happiest person alive. While living in Leamington Spa I was involved in a nasty road traffic accident and ended up in a bad way in hospital. I was in there for some weeks and went through a phase of re-evaluating my life and which direction my life was taking me. I slowly fell out of love with the graphics side of the industry and wanted to try something new. I found this very frustrating as I knew I had the capability to continue doing what I did, it’s just that my heart was no longer in it. 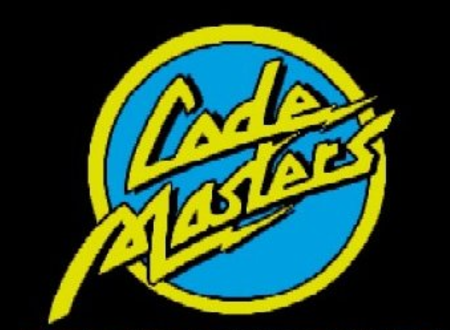 What is your favourite game you have worked on during your time at Codemasters? All the games I had worked on at Codemasters were all great experiences for one reason or another. If pushed though, I’d have to say Rockstar was my favourite. It was my first project in the industry, it turned out OK and it’s the one that raises a smile when mentioned in conversation. 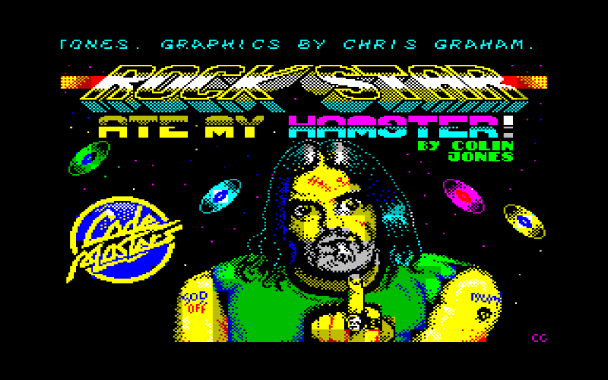 I am a huge fan of Rockstar Eat My Hamster and really loved the game and music. Please tell us about the development of the game graphics? Oh God, where do I start?! 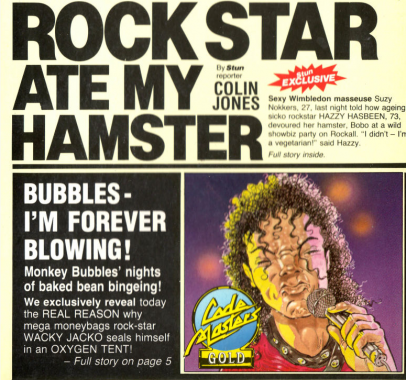 Colin Jones (programmer) wanted something along the lines of Spitting Image, but not Spitting Image at the same time(!). I found this very difficult as it was completely hard to create a characterisation of a famous popstar while keeping them recognisable all within the limitations of the area requested, plus not having them look like Spitting Image puppets. It seemed like it took an eternity to create the characters. I stressed endlessly about how they looked and if people would recognise them. 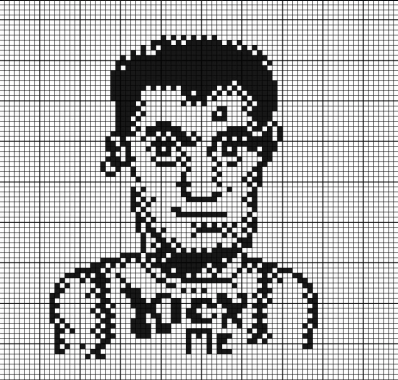 I would stay awake all night creating characters, deleting characters, re-starting characters, moving pixels a couple of places. There were some dark days and darker nights involved in their creation but they turned out alright in the end, I think. Did you think there would be an issue with the Music Artist at the time? I really didn’t think any of my characterisations would have caused offence (soz, if it did…). Looking back, I could have been a hell of a lot more scathing with the graphics, but I was young and didn’t fancy the idea of one o f the stars kicking-off because of something I had created. When the game was released, I remember Boots refused to stock it because of some of the content that was published in the free magazine you got with the game. At the time, I thought that was pretty ‘rock and roll’. A few of the artist now are a bit dodgy in the game would you ever consider doing a remake this would be amazing maybe get Allister Brimble to do the music? A re-make!? If the opportunity came along, I’d like to give it a go! I love the thought of the game with a modern make-over. You’d have Clive on his mobile and Cecil trying to broker some marketing deal via a dodgy website on his laptop. You could have your band appear on a ‘I’m a rockstar, get me outta’ here!’ type TV show. You could give your stars their own ‘FarceBook’ accounts and create a website for their marketing. There’s an absolute ton-of-stuff you could include in a game like that these days. I understand that you done the graphics for Rockstar Eat My Hamster, Magicland Dizzy, Kwik Snax and the CJ’s Elephant to name a few. Please tell me what the best part of making these games and the most frustrating parts? I think I pondered on my graphics far, far too much, especially on Rockstar. I would lie awake at night and worry about the smallest thing, even if was about pixels being slightly out of place. 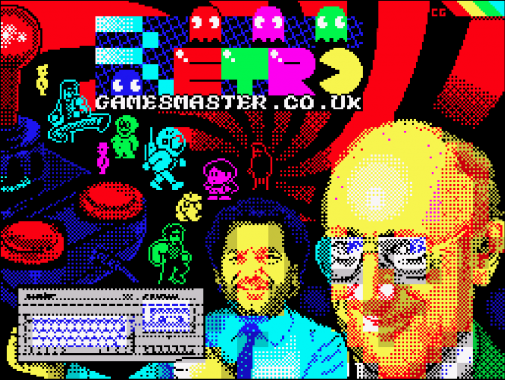 I remember, a few times I would fire-up the Speccy in the middle of the night and shove a couple of pixels around some graphics I had been working on at that time. Crazy. 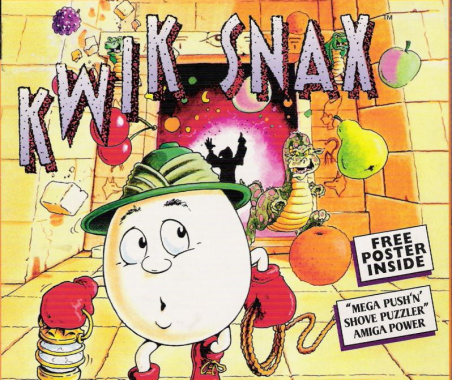 You did the graphics and some of the level design for Kwik Snax can you recall any of the levels you did? 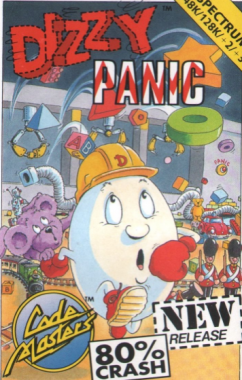 I can’t really recall individual levels as this was more a programmer-led creation, but I can recall the work that went into the intro sequence (the Dizzy Band). Lyndon Sharp (programmer) wanted to do so much more with it. Lyndon wanted the characters moshing, diving off the stage, an audience going wild and eventually the characters crowd surfing! Of course we were constrained by memory but the ideas we had were brill and it would have been awesome seeing Dizzy being held aloft by the baying crowds! Did you work with the Oliver Twins if so do you have any interesting stories with your time working with them? I never worked ‘closely’ with them but they were always around, doing stuff and I did speak to them, lovely chaps. Most of the talking was done after work, usually at one of the parties Richard Darling used to hold at his flat in Leamington Spa. Many chats with other developers usually happened at these get-togethers. Great times. Are you surprised that Dizzy and Retro is so popular after all these years. No, I’m not surprised about the popularity of either. Dizzy is a reflection of simpler times, simplicity of the earlier games and the simplicity of the character design. For many people playing these games, at the time, this would be their first steps into an interactive storyboard. Imagination is encouraged here, this in turn creates memories, many of these would have been magical and memorable. ‘Retro’ is this and much more, the sights and sounds of a particular time, playing older games allows users to venture back to their favourite time and the playing of older games allows these memories to become more ‘real’. 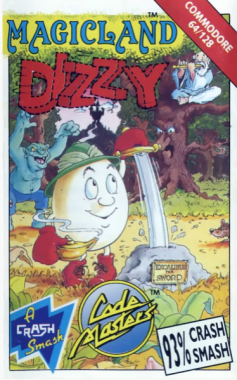 Would you ever like to reunite the Oliver Twins for the new ZX Next Dizzy game? That would be pretty awesome but I doubt they would return, I think they’re wrapped up in too many other projects now. It would be a big boost for the ZX Next to have their name associated with a game, though. Spent a good few years there, moved from QA to Evaluation through to level builder then eventually design. Worked on the first two Colony Wars games and also the PC game ‘Lander’. I moved to Warthog 1998/9 and helped with some level building on StarLancer. I also joined a few ex-Psygnosis (ex-Colony Wars) guys and lent them a hand in the creation of the game ‘Star Trek Invasion’ for the PlayStation1. I left Warthog in 2000 and joined GenePool, with the same ex-Colony Wars guys. I helped in the design and level building of the game ‘Wolverines Revenge’. Created initial designs and mission/environment designs for a PS2 Iron Man game. Unfortunately the Iron Man game never saw the light of day, although we had a very impressive physics engine demo where you controlled Iron Man around a massive pool table, you could carry/manipulate the pool balls by using your repulsor beams and fly around the table and into the pockets. It was wicked. When Genepool lost the licence for Iron Man it shut it’s doors and closed. It came as a complete surprise to me, I was stunned. I landed on my backside but eventually found employment outside of the games industry. A few of the GenePool guys went to work in America for different software companies and have helped create a number of really big name titles that have become super-successful. I have stayed in touch with them and we often reminisce about the Psygnosis/Warthog/Genepool days. I appreciate modern games and their immenseness and grandeur but they seem to lack soul. In getting bigger, faster and even more realistic, they lose a lot of the stuff older gamers seemed to have bucketloads of. Too much is delivered on a plate to todays gamers and everything is spoilered, like watching the trailer for a film you want to go and see, it maybe spoilered to hell but you’ll still go and watch it, but you’re only watching it for the spectacle. My favourite computer was my Amiga and 2 of my favourite:-) and my favourite console the Megadrive do you have a favourite? My Speccy was my favourite computer, followed very closely by the Amiga. Hmmmm…my favourite retro arcade game is Gorf. I remember playing this endlessly in a big arcade in the Isle of Man while on my hols, late 70’s/early 80’s. I was completely chuffed when I destroyed the alien-octopus thing in its spaceship for the first time, I felt like a hero! GTAV and Red Dead Redemption are really good games but I love the Just Cause series. I really like games that encourage you to try stuff out and to come up with your own way to complete levels/missions by utilising tools and weapons. Games that don’t take themselves too seriously and give you a massive sandbox to get lost and experiment in. These are the games I have had most fun with. Ha ha ha, couldn’t possibly say! I’ve played some trite in my time, games that have virtually eaten away at my own life-force as I have attempted to wrestle some fun out of them. I couldn’t pinpoint a single game though, sorry. If it’s not been done already…Possibly a feature about retro games and how these would have to be re-imagined for todays PCs/consoles. How would a game like Scuba Dive be approached for todays market, get opinions from the developers of the original games.